Marcia is a pleasure to work with and her work is beautiful. She is very flexible in trying out different styles and color combinations. Marcia happened to be personal friends with my printer and gave the printer, the client, and me ample reminders to keep us on schedule so that the calligraphy wouldn't stand in the way of mailing. She ensures her clients' privacy when completing a job and will not post photos to the web unless given permission. She is extremely professional and incredibly well priced. The only downside is that because she is so in-demand that she books up months ahead! The client LOVES the work as do I (the stationery designer). I will definitely work with Marcia again. We only had a small number of invitations for Marcia to complete, as well as our place cards, but also had a couple of unique instructional table cards. Marcia was wonderful to work with, extremely responsive, and reasonably priced. 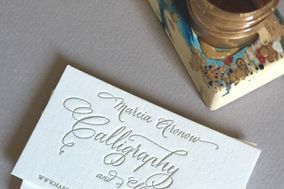 She was passionate about her work, making sure she created an ink that matched our invitations, and very quickly fit us into her schedule, even though I kind of procrastinated and didn't give her a lot of time! The final product was stunning -- absolutely works of art!! We were thrilled with the results, and the feedback from our guests was wonderful! Would love to have a project to work with Marcia again!! We were very proud to send our daughter's wedding invitations in the envelopes that Marcia addressed. They just couldn't have been nicer. Each one is a work of art. We received many compliments on them. Marcia makes sure everything is perfect. She is great to work with, she delivers on time, and you know exactly what the price is going to be. Highest recommendation. Look no further for a calligrapher. Marcia Aronow is everything you could ask for from an artist and a professional. Her work is perfectly beautiful! She did my daughter's invitations and place cards. Marcia holds herself to the highest of standards. As a result, her work is consistently outstanding in every way. I cannot recommend her highly enough! It was my pleasure to do the calligraphy for both weddings in your family this year. Thank you!